Northern California vintners are already looking ahead to the next wine harvest and bracing for impacts as the drought deepens. Some will be hit much harder than others. "Yield is going to be the major factor this year," says Domenick Bianco, who oversees growing operations for Renteria Vineyard Management, which farms about 1,300 acres in the Napa Valley. Sometimes smaller yields can produce very high-quality wines. 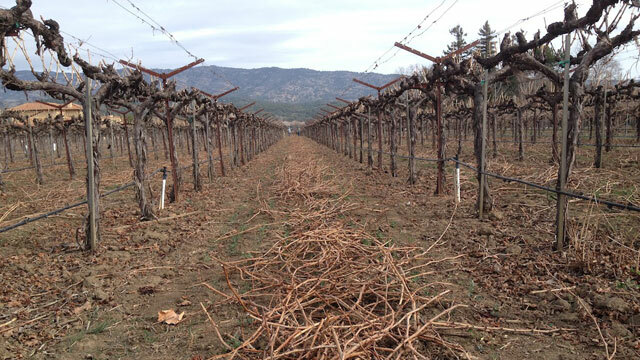 Napa growers are aggressively pruning back vines, which will concentrate precious water and nutrients on a smaller number of grape clusters. But fewer grapes still mean lower profits. "We could see a dramatic reduction in yield, so it could have a very large economic impact," warns Bianco. It's too early to tell what that impact will be. Napa County's grape harvest produced $656 million in 2012 -- that's just the grapes, not the wine. But the impact is almost sure to be worse in regions like the Anderson Valley and the Central Valley, which are more reliant on surface water. Napa growers say the abundant groundwater that lies under the valley should cushion them from the kind of water crises unfolding in other winemaking regions, like Paso Robles and even Mendocino County. But they're not taking it lightly. "In my opinion it's very serious," says Hal Huffsmith, senior vice president at the Trincharo Family Estates unit of Sutter Home Winery. "Groundwater is a crutch at this point." It's also expensive to pump out, which further squeezes margins for growers. "Our fields are not up to capacity. There's not excess water in the ground for our vines to feed on," Huffsmith explains. "It could be a very significant and serious problem going forward, as we're not able to compensate effectively the loss of winter rainfall." So far that rainfall is looking pretty pathetic. Huffsmith says the region has logged about two inches, whereas area vintners would normally expect ten times that amount. Growers say there is still time for substantial rain to fall before the fruit emerges, though there is little in the forecast. The lack of rain could leave vines more vulnerable to damaging insects, and there'll be less water to ward off frost, if there are more cold snaps this winter. Growers who count on draws from the Napa River for frost protection have been told that river water won't be available this year.